If you are a blogger who wants to know how much search volume a keyword gets every month, this beginners guide will resolve your troubles and worries. I know that the search for a perfect keyword can drive people crazy. I’ve been there, and I can help. But let me ask you, does it matter how much searches per month a keyword gets? Let’s go over some important things about this aspect of your keyword research before we decide should you focus your attention on search volume or should keep your mind at something else. What is the Keyword Search Volume? If you have been surfing the net or using some keyword research tools recently and you wonder what keywords search volume is, the answer is pretty simple. This metric represents the number of times people search a particular keyword usually every month. Many bloggers go wild once they see that a keyword has a high search volume. If you see that the number is large, it means that a keyword is valuable and it might be worthy of trying to get ranked for it. However, this metric is not always the same. It tends to fluctuate depending on the season. And I wouldn’t get excited every time I see some big numbers. For example, ‘beach towels’ can have a high search volume, but not in December. Some keywords get high search volume when the need is great. On the other hand, there might be periods of stagnation if the demand is offseason. How Important is the Keyword Search Volume? I rarely take this metric too seriously. Yes, it’s nice to see that a keyword has a high demand. However, that also means that the same can have a lot of competition which can make it harder to rank your content. Many big players in your niche have probably already ranked their material on the top of the search engines for that keyword. If you are a small website, then search volume is the number you shouldn’t focus. It’s not essential such as some other metrics. I’m not saying that you shouldn’t focus on this metric at all, but don’t take it too seriously as well. When researching for keywords, I tend to stay focused on finding a low competition long tail keyword instead of trying to focus on the search volume. That way, I can get a chance to pick up some narrow topics the large players have been overlooked. It could be a wise move for you as well! At least until you build some authority within your niche. There is no optimal or good number for this metric at all. You can do well even if you choose to go with a keyword with a low search volume over the one that gets high volume. 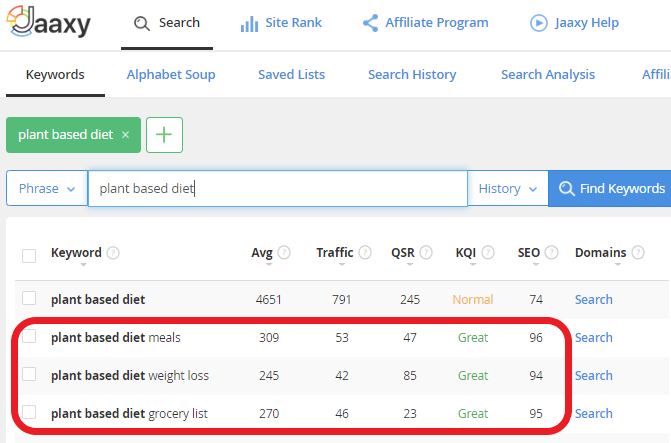 As I have said, I tend to focus on finding a low competition keyword rather than the one with a high search volume even though I have found a way how to merge them together which I will share by the end of this post. If you are familiar with long tail keywords then, you should know they are in more demand than ones with a large number of searches per month. People are getting specific with their demands on search engines, and as a result of this demand, we get more and more brand new long tail keywords each day which are not answered adequately. Someone should cover them. Why not you? The two primary reasons why I focus on long tail keywords are already mentioned demand and the second one is conversion. That is what I recommend you as well, especially if you are marketing your content. When you search Google by using a long tail keyword, you will get many mixed results which will rarely satisfy your needs. All of the results that you will get are the large sites trying to establish a brand name for themselves. They all offer solutions unrelated to your search intention. And in most cases, people abandon the search because they haven’t got any specific results. People use Google to get specific results, and that is what they expect. Therefore, marketers are now focusing (Google as well) on more narrow search terms that deliver the results. The fact is that people will buy from someone who gives them exactly what they asked for rather than from someone who throws a bunch of info in their face for the sake of rankings and high traffic volume. When I think of the search volume, I don’t look at it with large hungry eyes as I have maybe used to look before. So, my answer to the question of what is a good keyword search volume would be, there is no right answer. If you can get ranked for a long tail keyword with 50-100 searches with at least 10-20 clicks per month, you are right on your way! Everything above that is excellent! How to Check the Keyword Search Volume on Google? There are many keyword research tools that you can use to find keyword search volume. My favorite tool is Jaaxy. With Jaaxy it’s pretty simple. 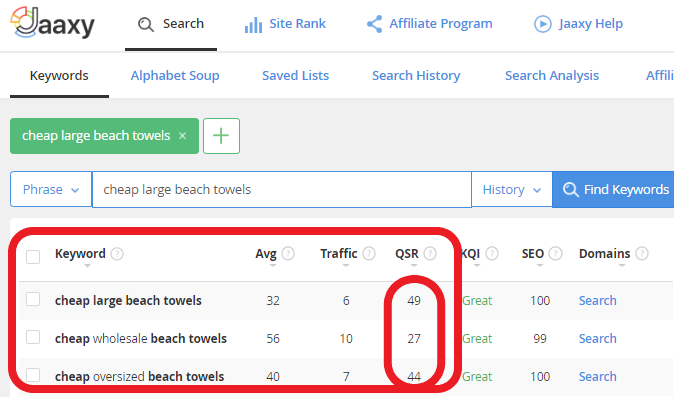 As you can see from my example from above, the keyword ‘beach towels’ has almost 5000 searches per month! The traffic count is nearly 800 visits if your keyword gets ranked on top of Google. As I have said, and I’ll repeat one more time, it can be a tough and demanding task to get a piece of that pie. Moreover, the search term itself is pretty broad, and despite the high volume and traffic, it might not convert so well. People are going to move on and search for more narrow topics related to it because these results are not enough to satisfy their needs. That is why I will always try to fulfill the demand for more specific answers before trying to reach for a high volume rankings. 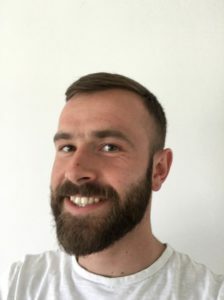 In other words, I would go for profitable low competition keywords first and then when I pick up some authority in the niche, I’ll try to reach for those big numbers as well. How to Rank for a Keyword with High Search Volume? The following is a method that I have picked up from a colleague blogger/marketer who has been using it to rank his material successfully. It’ pretty simple method and I would recommend you to go with it. It’s proven to work. For the rest of the post, I’m going to use another example to paint you a picture. 1.) Find a high search volume seed keyword. Try to find a seed keyword that has at least 1000 searches per month. Look for something you know about, and you can share with other people. If it’s a plant-based diet, don’t search for something out of your domain. 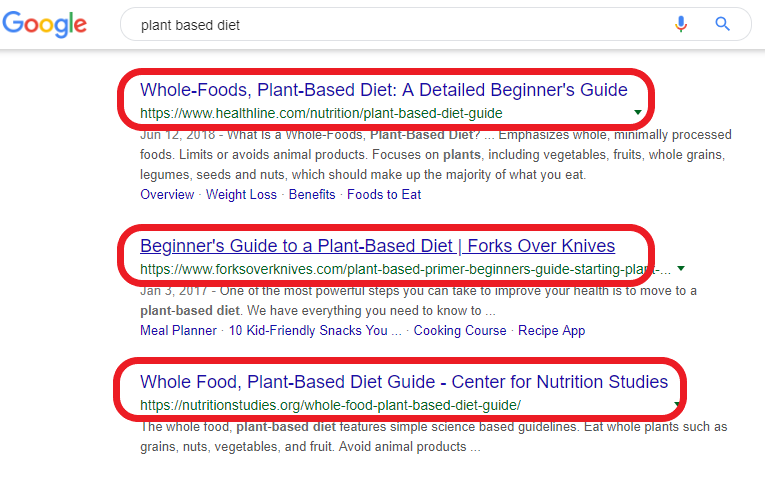 If you have a blog where you write about a plant-based diet, do a little bit of competition research on Google to get your initial idea. This way you can have a chance to see what actually works for others and what might turn the trick for you as well. It’s essential to stick to your website topic because if you go for something that you can’t break in smaller pieces, you’ll be doing a good deal of work for nothing. After you get an idea and manage to find a high search volume keyword, dig into your mind as well as into material you already own to prepare the grounds some more. The second step is where you create an authority article or a blog post. Don’t rush the process. Give yourself enough time to do high-quality topic research. Collect as much information as you can. You can go and read other guides that already exist online to get a frame idea for your own. As you can see, the first three results in Google are all Guides!!! People tend to shy away from this kind of posts because they think they never get raked for it. However, if you have a handful of helpful knowledge which can serve others plus a good strategy and patience, your guide might appear on top of the search one day. For this kind of scenario, it takes time. It’s not an overnight process you know. But once you get rewarded, you will get an idea of how it works. Then you can repeat the process over and over to keep building the traffic count on your website. I like to keep Google’s mission in the back of my head all the time to remind myself that an excellent service beats everything. Google is always on the hunt for sites that have something useful to share. Therefore, once you have found a high search volume keyword, it’s a logical thing to assume that people want to know more about it. It’s also a reasonable thing to believe that if you have a lot of knowledge on the topic, you can help them to fulfill their mission. 3.) Find two or more low competition long tail keywords. After you have created a guide type of content, use it as a source of long tail keywords with which you can expand the topic some more. Let’s stick to our example of a plant-based diet type of website. When you have a great piece where you have shown people how to start a plant-based diet in a step by step manner, you can use your work to search for more ideas. Try to analyze your work to see what parts of it can you expand more. This way you can find at least two or three long tail keywords that might be having a low competition. The reason why you should do this is to fortify your authority article some more. If you take it seriously, you can get an unlimited source of related long tail keywords within your topic. Every new article that will be created will have at least two more long tail keywords in it which can be used to develop the new material related to your initial guide. Try to think of it like you are trying to build a pyramid only your construction start from the top and spreads in every direction as you go. Your authority article is the top brick. In the world of SEO, it’s also known as a cornerstone article. Everything that comes after it will fit it correctly as you move on. 4.) Link those posts with your guide. A good link strategy is always appreciated. There are two scenarios on how to accomplish this. You can link to other sites to show that you are relevant to your topic. However, there is a downside to this one. You are sending people away from your website. You might be doing someone a great favor for nothing. I highly recommend to not go with this one! If you follow the steps so far, you will have a bucket full of great content on your website which can be linked together in one big category. You see, when you link to your stuff, you are showing that you value your work over someone else. That is a good thing in the eyes of the search engines. If you don’t evaluate your stuff, why would anyone else appreciate it? 5.) Keep building your material! As you keep building your pyramid of information, your content will grow larger. All of it should lead to your Guide from the beginning. And as a result, one day, your guide might appear on the top of the search for a keyword with a high search volume. This strategy might not work every time 100%, but it’s proven to work. And even if your guide never shows up, you will rank for at least one-third of those long tail keywords which will be a nice addition to your traffic count. It’s a win situation however you turn it around. Understand that no one gets ranked on the top of the search for every single piece of content they publish. Not even authority sites! There is no perfect search volume number in keyword research. You can get ranked for keywords with a high volume demand but miss some others that can convert nicely, and it can go another way around as well. Also, don’t fix your attention to those numbers strictly when doing your keyword research. For a long term success in this game, you should stay focused on giving value to the users of the search. Build your blog diligently every day while remaining focused on a topic instead of keywords. The more valuable content within one topic you can serve, the more success you will achieve with Google and other Search Engines. I hope this article has helped you to understand keyword search volume as well as how you can get ranked for keywords that have a high number of searches per month even if you are not an authority site yet! If you are interested in learning more about keywords, online marketing, how to set up a website from scratch, monetize your content, write content, and more, I invite you to check out Wealthy Affiliate. Ever since I have joined Wealthy Affiliate University, my success is going wild! Hi Ivan. Great post and full of special nuggets for beginners like me. I was wondering when you are looking for keywords what is the minimum Avg are you looking for and what QSR maximum? Very interesting work, congratulations. Hi Claude, I hope you got your answers. The strategy that I’ve laid out is proven to work but it takes a lot of time and concentration of effort on one article (guide). Make sure you get it right. Thank you for stopping by. If you have any questions, ask away.